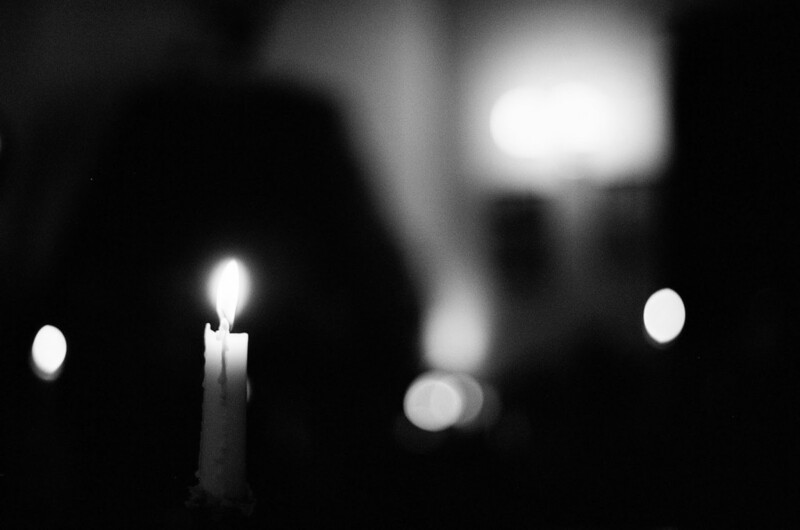 All photographs taken with a Pentax MX 35mm camera, Pentax-M 50mm f/1.7 lens, and Ilford XP2 400 black and white film. 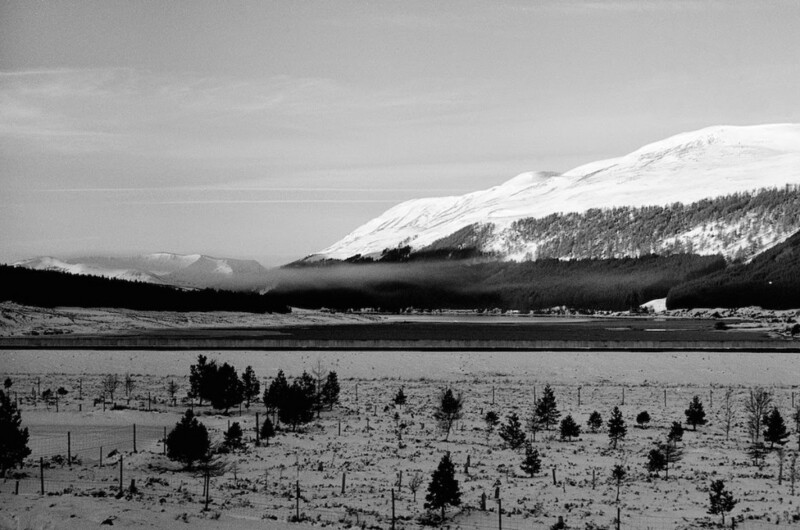 On the 2nd of February 2015, I took the long train north and alighted at Aviemore. 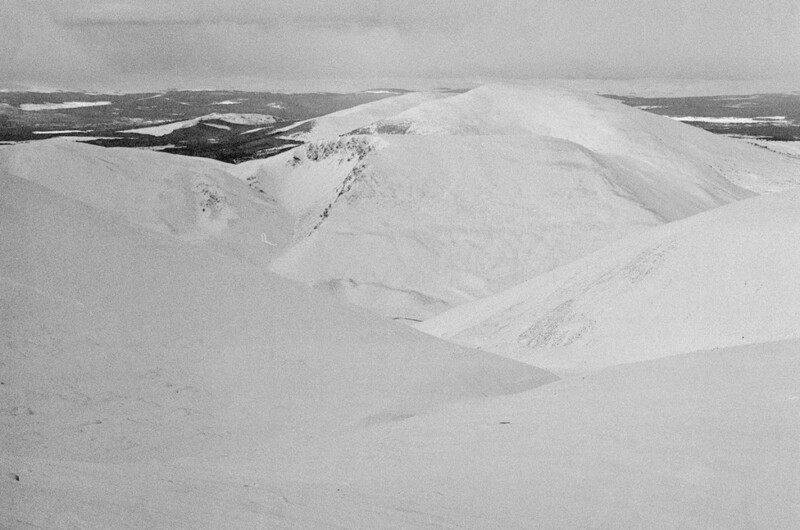 My mission was simple: to hike into the Cairngorms and get up some hills. Given the quantity of snow on the ground I didn’t have any ambitious plans, but two ideas presented themselves: either get to the Hutchison Hut and climb some of the Munros in that area, or use Ryvoan as a base and climb Bynack More. I secretly wanted to do both. When I arrived in Aviemore it was quite clear that the depth of snow up in the mountains would require either snowshoes or skis. 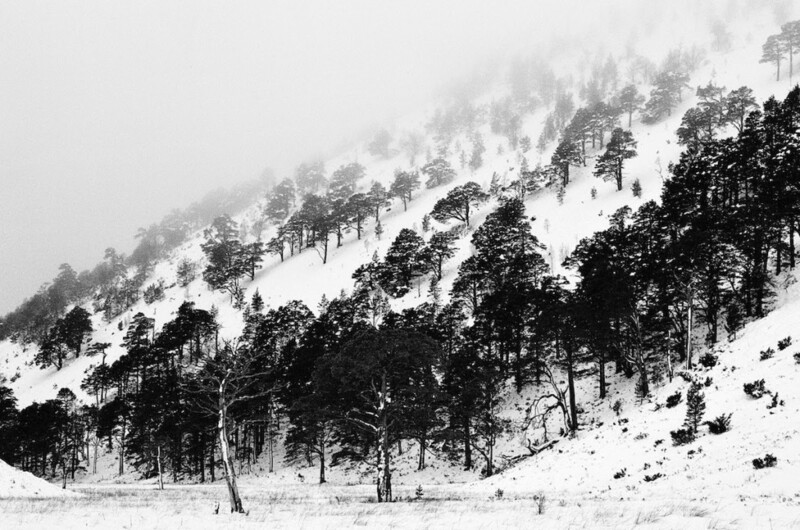 Aviemore was under about six inches of snow, and people were skiing about in the town. The roads were pretty bad. I made inquiries at all the gear shops in town. 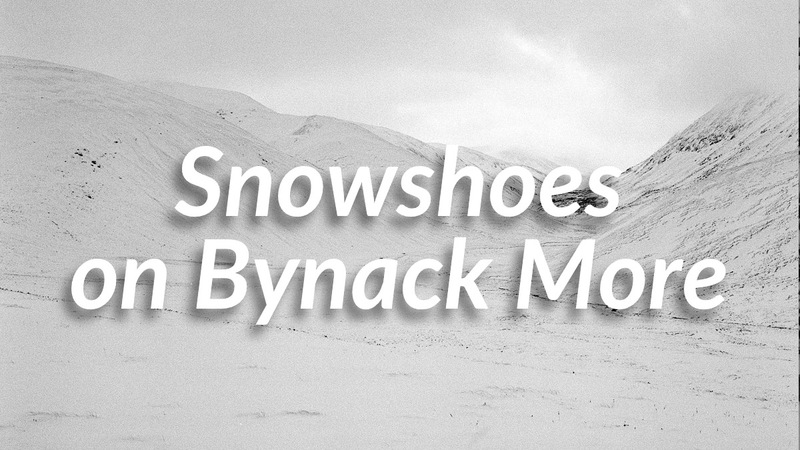 Nobody had any snowshoes — every shop I visited had just sold out. Fortunately I already had advance intelligence that the little ski shop at Glenmore had snowshoes in, so I started walking. The hike through Rothiemurchus is pleasant at any time of year and I always enjoy striding between those grand old Scots Pines, hopeful to catch a glimpse of a red squirrel or red deer, maybe even a wildcat. On this occasion I’m sorry to say I saw no wildlife whatsoever. 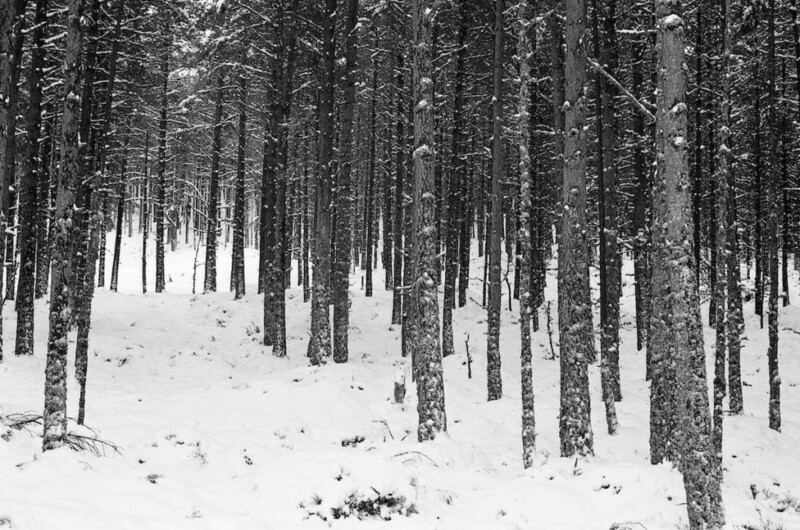 The forest was still and utterly silent under its blanket of snow, which grew deeper as I approached the mountains. There was very much a sense that the forest was asleep for the winter. I received a friendly welcome at the Glenmore ski shop where, to my surprise and delight, I found that they had adopted a remarkably tame robin who was singing merrily inside the shop. They soon fitted me out with some snowshoes. Although renting them was an option, I decided that buying them would be more economical in the long run. They’re not particularly technical but served me very well for this trip. 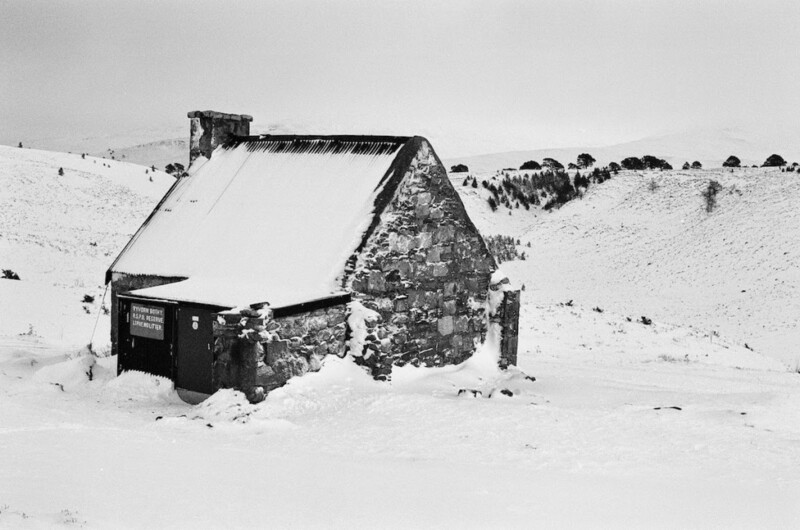 I began the short walk through the forest to the Ryvoan Bothy. Ryvoan is not one of the legendary bothies of Scotland. It’s pretty close to the nearest road, the walk-in is easy (if scenic), and a stay there cannot be considered essential for the ascent of any mountain. Bynack More is the closest Munro, but I suspect most walkers simply begin their route at Glenmore Lodge. However, Ryvoan does have positive qualities. It’s a snug building with a good fireplace and comfortable sleeping platform, plenty of chairs, and hooks on the walls and roof for safeguarding food from rodents (I’ll come back to this later!) The only real disappointment was the lack of a bothy book. I enjoyed the walk to Ryvoan. 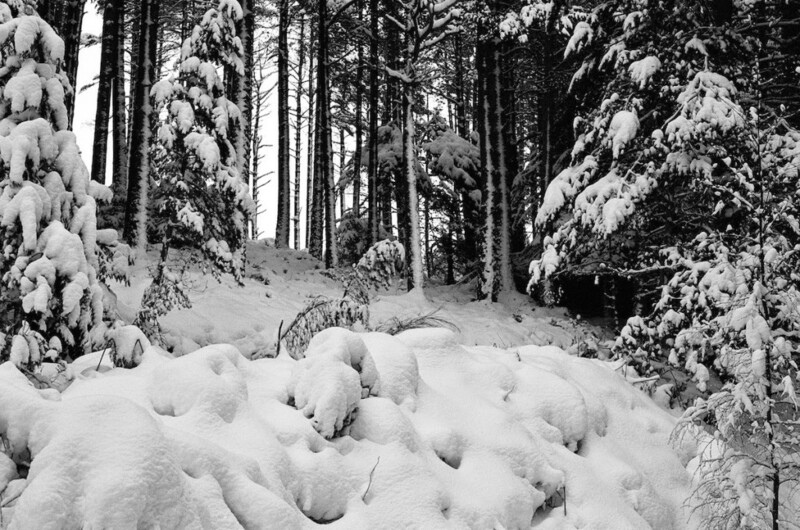 The forest is beautiful there, and covered under such a dense carpet of snow it had the feel of a remote Arctic woodland. The snowshoes eased my progress; not many others had walked along the track since the last snowfall, although I could see ski tracks (and later met a pair of skiers). 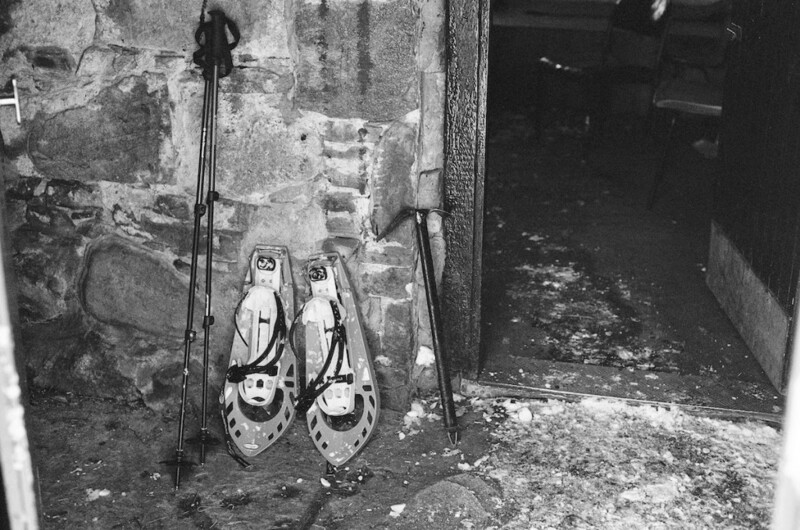 When I arrived at the bothy, I unpacked and chatted with the other chap who had also just arrived. 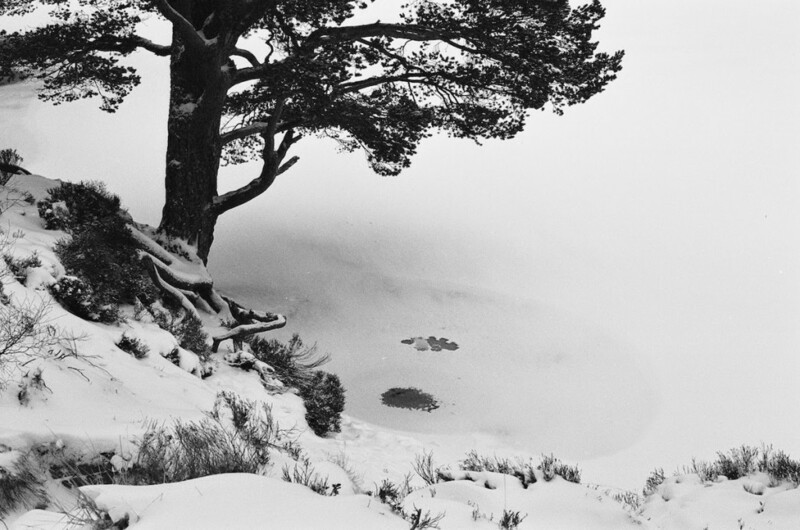 He was called Pat, and had just come from the other side of the Cairngorms with a heavy pack. It’s fair to say that he was utterly knackered after slogging over two hills with a 20kg load. Pat was an interesting man to talk to and it turned out that we had visited many of the same mountain areas over the years. Keen to get out and see some views before the last of the light, I plodded a little way up adjacent Meall a’ Bhuachaille. A loaded and dodgy-looking slope stopped progress at about the 530m mark, though. 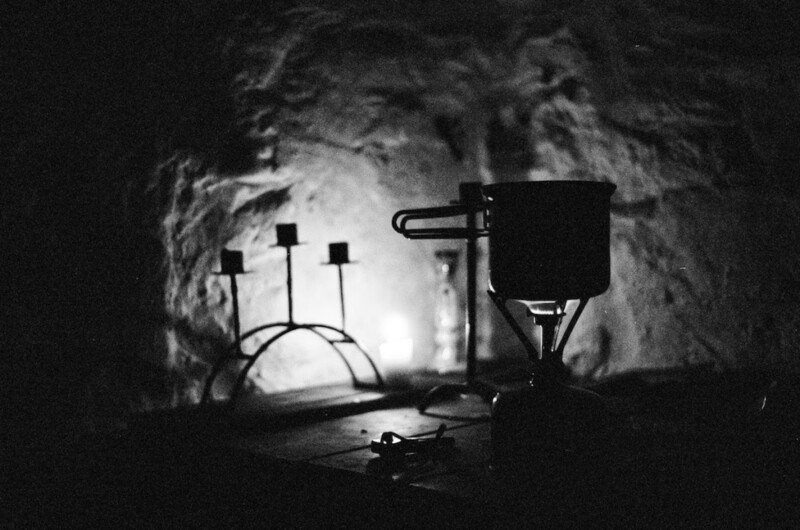 I returned to the bothy and got a fire going. That night I was kept awake by the interminable racket of the Ryvoan mice, who liked to use an empty tin on the shelf as a hamster-wheel. I began my walk at first light. The access track in the bottom of the glen was very deeply drifted over, and even snowshoes couldn’t prevent me from postholing in the softest stuff. They definitely made a difference, allowing me to walk over some surfaces I would have sunk knee-deep in had I been wearing boots, but it was still hard going. Progress was slower than I would have liked. Views were misty and I didn’t see the bulk of Bynack More until reaching the footbridge. The mountain looked completely white. I kept plodding through the snow. It’s a very easy ascent, possibly one of the easiest Munros I’ve done. 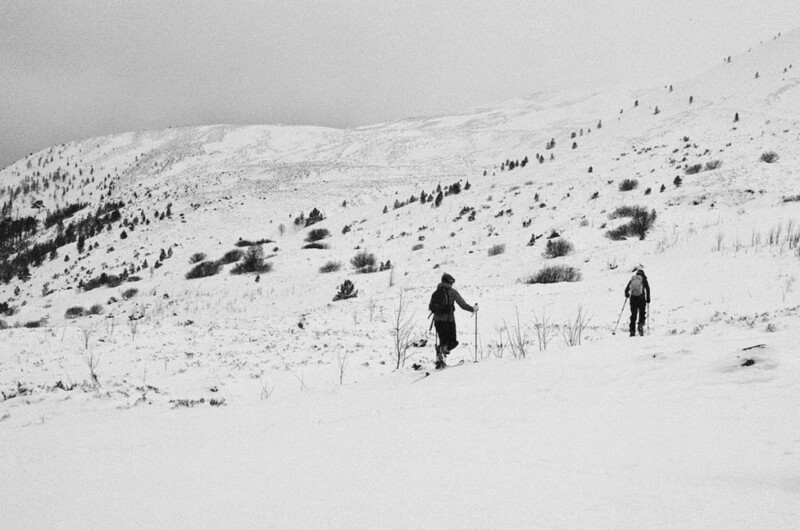 The initial ascent follows a gentle path up an easy spur of land, browsed by grouse. I could see black tufts of exposed heather where the grouse had been digging for fresh shoots. Of course, the conditions made the going much more difficult than it would be in summer, and everything was pretty well drifted over. I couldn’t see the path for most of the way (not that following the path was at all necessary on that kind of terrain). I reached the large flat plateau north of the summit ridge. This area undulates gently and has a few spot heights of minimal prominence, but in general it is a featureless area. Visibility was not at all bad (maybe a couple of kilometres, with cloud hovering at 1000-1100 metres) but the lack of contrast, white on white, felt almost as disorienting as being in a proper whiteout. 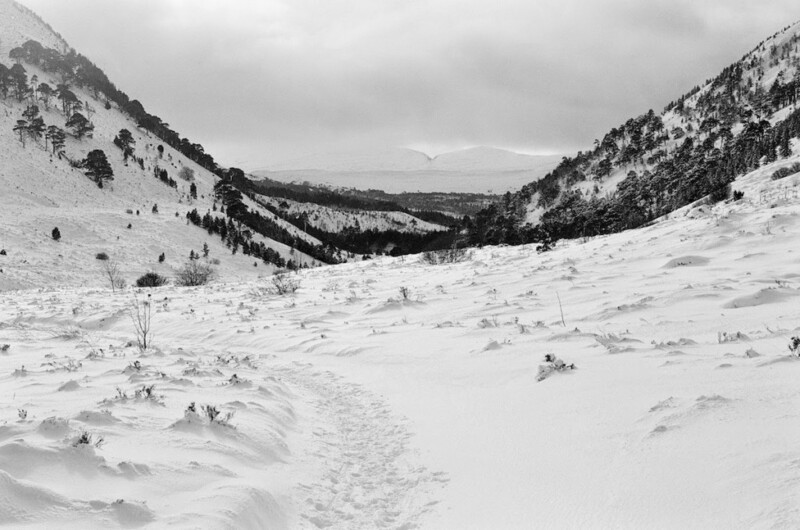 I trudged along through the deep drifts. A lot of white. This is the last clear shot I got before the summit ridge and the clag set in. When I finally reached the base of the summit ridge, the wind was getting up a bit and the terrain ahead looked much steeper. I decided to swap my snowshoes for crampons and my trekking poles for an ice axe. 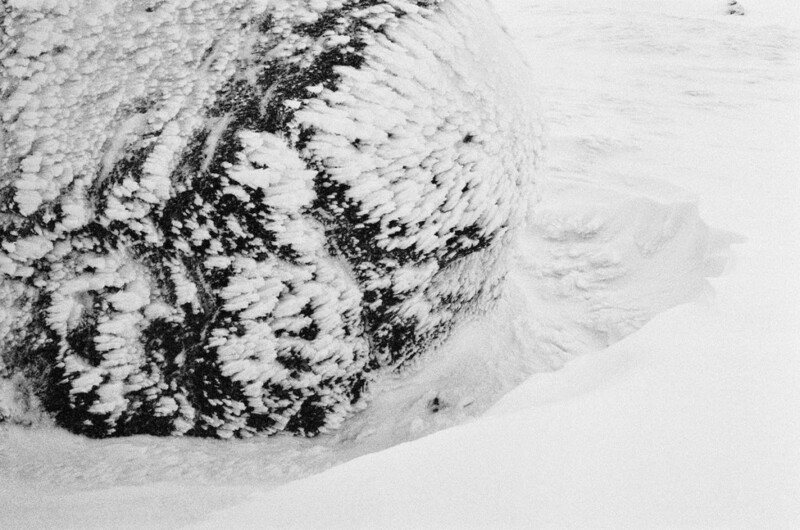 This proved to be a good decision because the rocks were coated with rime ice and much of the snow on the crest proved to be iron-hard neve. The wind increased as I climbed, battering me from the side. It got a lot colder, too, and I swapped my liner gloves for Dachsteins. Navigation was never an issue as the ridge only goes one way, but with the poor visibility and lower temperatures it felt very different to the benign conditions on the plateau below. By the time I reached the summit I couldn’t see a thing and my beard was iced up. I didn’t pause on the summit for long. I retraced my steps and descended the ridge swiftly, returning to the place where I had hidden my snowshoes and poles in the lee of a boulder. Back on with the snowshoes and off across the plateau! Going the other way, without the shark’s fin of Bynack More to guide me in the distance, I had to pay a little more attention to navigation. I took several bearings to take me back to the footbridge (it was getting dark by this time) and I have to say it was ideal terrain for that kind of dead reckoning. It felt good to be using map and compass properly for the first time in months. By the time I returned to the bothy, eleven hours had somehow elapsed — much longer than I expected for a 10.2 mile route. Even with snowshoes, my progress in the deep snow was slow and the going was more tiring than you might expect. Back at Ryvoan, which has a very handy gear porch. Now I’m going to tell you a pathetic tale. Before I left for Bynack More, I made sure I hung my food bag from the hook in the middle of the ceiling. The idea is that mice cannot get to your food up there. I thought my stuff was safe, suspended more than two metres above the floor. When I got back, I found that mice had somehow entered my food bag and devoured a truly astonishing quantity of victuals. They had eaten an entire malt loaf, three packets of dried pasta, and several packets of oatmeal. They’d also shredded the packaging for several other food items and generally made a mess of everything. The only things they hadn’t touched were the cereal bars (sealed in plastic tubs) and, bizarrely, the cheese. I truly have no idea how they managed to get up there. I can only conclude they must have constructed some kind of ladder, or developed flying powers. To make matters worse, the little devils had left their doings in my sleeping bag and my saucepan, in which I’d left some snow in the hope it might melt while I was out on the hill. Now, my intention had been to trek out to Hutchison and climb some more Munros, but with a decimated and spoiled food supply — now hardly enough to feed me for a single day — that was no longer a sensible option. 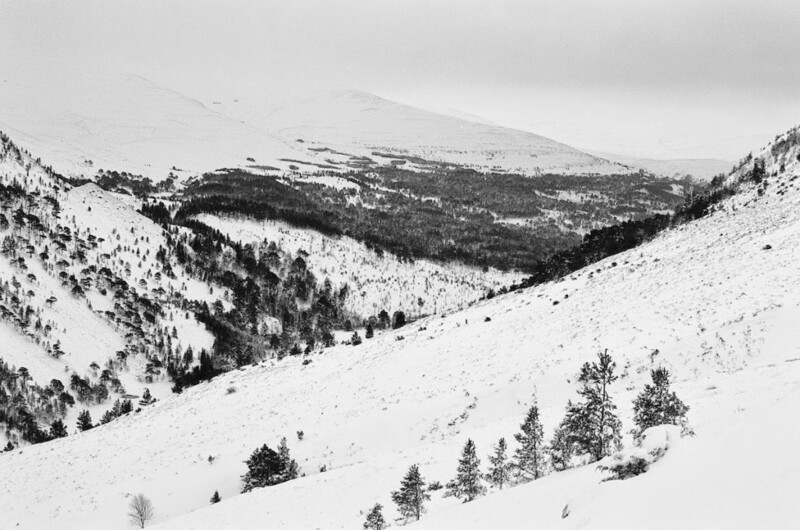 Besides, the walk to Hutchison would be hard going, and I had concerns about the snow slope from the Loch A’an Basin up the back of Cairngorm. 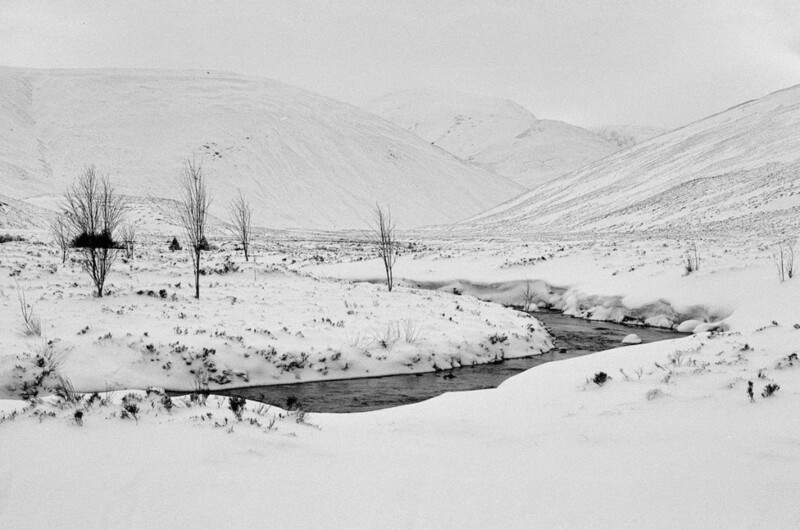 I decided to head back to Aviemore the next morning. It’s possibly the most ridiculous reason I’ve had to cut a trip short yet, but after half an hour of moping I must admit I saw the funny side of it. I noticed one of the mice sitting on the table and twitching his nose at me. He looked fat as a barrel. As I walked back to Aviemore the next morning, I reflected on the trips to the mountains I’ve enjoyed over the last few years. I thought about failed objectives and trips that, in one way or another, ended up being a disappointment. It always came down to names of summits on lists. As I passed the frozen lochan, and listened to the snow melting and dripping off the trees, it occurred to me that the actual summits I write down in my logbook are not why I do this at all. The reason I venture into these beautiful and wild places is to be there and enjoy the journey. The mountains are a constant in my life, and when I’m amongst them I think more clearly and more honestly. I’m a better version of myself when I’m in the hills. They encourage me to be the best I can be, to take every opportunity, to always be thinking about how I can improve my life and make the most of everything. There’s simply no other way I can put it. In everyday life a person can be stressed, tired, over-worked, lazy, selfish, and focused on things that don’t matter — but it’s difficult to be any of those things when you’re in the hills. Every time I visit the mountains, I gain more than I can possibly put into words. That’s why I’ll keep coming back no matter how many times mice eat my food, or the snow is too deep, or I fail to climb hill after hill. It’s good for the spirit.